The General Data Protection Regulation (GDPR) will come into force on the 25th May 2018. Currently many organizations are considering the actions to take to become compliant before the deadline. 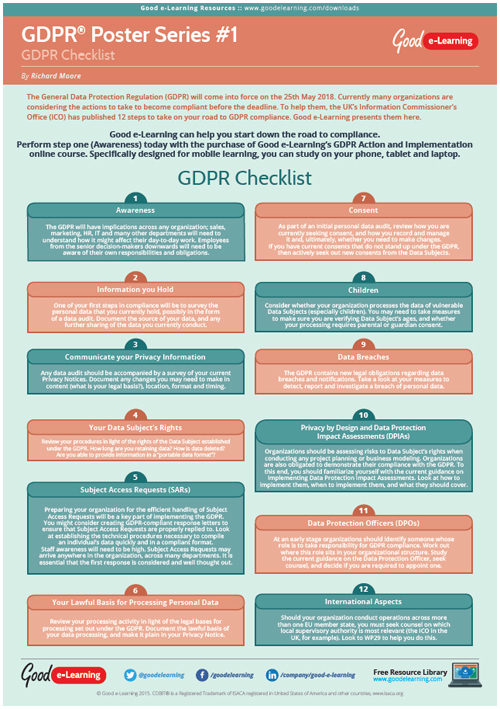 To help them, the UK’s Information Commissioner’s Office (ICO) has published 12 steps to take on your road to GDPR compliance. Good e-Learning presents them here. If this GDPR resource interests you, why not view our range of Governanace & Compliance courses? Or view our full library of downloads covering a wide range of subjects and domains!